Why plan your garden ahead? Here you are, stuck indoors with only the memories of your bountiful summer garden. Or maybe in reality it wasn’t such a bountiful garden…those tomatoes never did really produce well. Or maybe you had wanted to start a garden – you had thought about it, talked about it but just never quite got around to it…Now’s the perfect time, no matter what last year’s situation was, to send away for a stack of catalogs, curl up in a cozy chair and start your next year’s garden planning. There are endless possibilities for this coming year. Garden planning is relaxing. When my catalogs arrive in the mail, I feel the same excitement I did as a kid when the Christmas catalogs came in the mail (anyone remember the Sears Roebuck, Montgomery Ward and Miles Kimball catalogs?). And if you hate the paper, no worries, you’re not left out because almost every company offers their catalogs online as well. Not only is it relaxing but done wisely, it can result in a better garden, with more variety and better yields. Which brings us to a warning we feel obligated to mention (lawyers may be involved here): be careful while browsing! You do know what happens when you take your four year old to the toy store? Just so you know – it can be easy to get carried away. Do you know how many seed catalogs there are out there? Some catalogs are more informative than others and that’s a good thing to look at as you’re browsing. As someone looking to buy seeds, you want to have a good description of the plant you’re going to grow. You need to know how big it will get, how far apart to plant it, how long it takes to sprout, and when it will actually produce fruit. Does it grow well in the heat or the extreme cold? Is it prone to diseases in damp weather? If I tend to have a late frost in May, I want to grow a variety that can withstand it; if my August temp’s are over 90, my plants have to make it through. A good catalog is going to give you information on this. You need to know something about what that particular variety can and can’t tolerate to make a good, educated choice. There are catalogs for everything you can imagine – and things you had no idea even existed. We’re going to give you a list of some of the best general catalogs out there as well as a few specialized ones. Some of these companies are big; some of been in business for a long time; some are small or are relatively new to the market. All have good reputations and have something that makes them unique. It can be worth it to go with a specialized catalog if you’re really passionate about growing a particular item. If it’s a long-term investment of either your time or money, such as a fruit tree or asparagus, it’s best to shop around and do your research on what will work best in your area. A company geared towards either those specific plants or your region is the best way to go. If you want to save your own seeds, you’ll look for Open Pollinated or Heirloom varieties. A lot of times these are abbreviated in catalogs as (OP). When you grow these, as long as you’ve taken care that they don’t cross breed with another variety, you can save the seeds and plant them next year. It’s a fun project and can not only save money but can help you develop seeds that are adapted to the very specific climate you’re growing in. Heirloom varieties are also living history – some of these have been grown for hundreds of years; some were unique to a certain region or family. There’s a lot of interesting stories around some of them. They preserve genetic diversity at a time when a few big seed companies want to license and patent seeds so growers are forced to purchase a few varieties from them year after year. The other type of seeds is hybrid. There’s nothing wrong with buying and using them and in some cases, hybrids may be an easier choice for a particularly challenged environment because they can be bred with specific disease resistances. That’s no guarantee but it can be a help. Weigh out all of your options and see what works the best for your situation. So now you’re prepared to spend a few pleasurable hours browsing. Don’t make this a rushed thing; enjoy it and take your time. Just thumb through and dog-ear pages or circle things you like as you go through the catalogs. It’s okay – go ahead and be a glutton! We’re going to put these aside for a few days and make a reasonable, realistic plan before you actually spend any money. When you’re ready for a second look, make a real assessment of the actual garden space you’ve got and what you need and want to plant. Now’s the time to be realistic. You can’t plant all of your corn and potatoes for the year if you have a 10 x 10 foot space. Don’t decide you’re going to grow all of your tomatoes to supply sauce and paste for the year if you work 60 hours a week and have three children under the age of 4. If this is your first garden, don’t decide to plant one of every vegetable. Make this a successful experience from the start by being realistic. We all bite off more than we can chew but keep it within a reasonable limit. If you want to go crazy, buy some extra radish or lettuce seeds; you’ll find a place to tuck them in and they won’t go to waste, even if they aren’t used this year. Once you’ve decided what you want and need to grow, go back and work through the catalogs you really liked. Pick a vegetable to start with, say for example tomatoes. You may want to make a list of the varieties that really caught your attention. Maybe you want to plant a paste tomato, a yellow tomato, a big ol’ beefsteak and some tiny ones for snacking. Use that general plan and narrow down your choices. Make a list by those categories and then weigh the pro’s and con’s with each selection on your list. Maybe one paste tomato matures faster; maybe one has less seeds. Take a look at things like days to maturity, your climate, the amount of space you have, the flavor description, and what you want to use it for. Now you’ve got to make the hard decisions. Some varieties should rule themselves out easily: if you live in Zone 5 and that tomato you liked takes 110 days to maturity you should probably cross it off the list and find something that matures faster. Make a note of which catalog offers that variety and the price – there can be significant differences. Sometimes it can pay to order all of your seeds from a single source, depending on how the shipping and handling fees are set up. But if there’s something you really want, it can be worth it to figure out what else you can buy from that company to justify the shipping cost. After you’ve gotten all of your essentials planned out and decided upon, you can give yourself permission to go back and look for the little fillers or “fun” items. Maybe there’s a new flower you want to try? Never planted gourds before? Maybe you want to add a few unusual herbs in between plants? This is where you can be creatively inspired by the catalogs and all of the things they offer that are really unique. You may end up with a new discovery that becomes one of next year’s “regulars”. Good things to look for as easy additions are “off-season” vegetable (early spring or late fall), small varieties you can tuck in among your regular beds (lettuces, herbs, greens and flowers) or container plants. Have fun and relax with this even as you’re making your plan. Its part window shopping, part daydreaming and part just good old garden planning. When it comes time to start those seeds, either indoors or out, you’ll be ready. 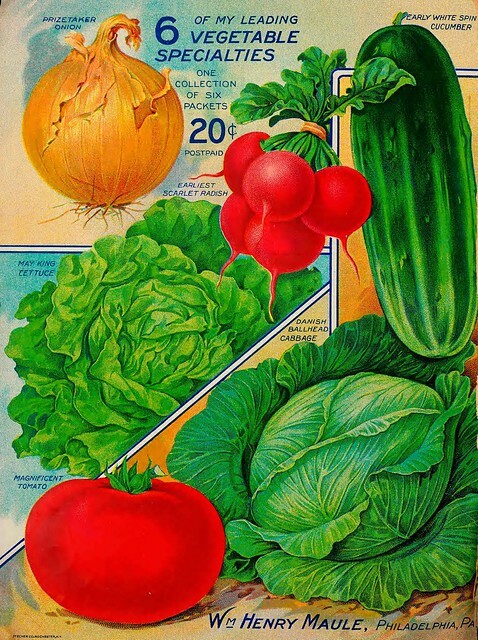 As you get more into reading the catalogs and trying different offerings year after year, you may find yourself coveting a particular variety or a particular vegetable. You look at the catalog and get upset because the green beans you had ordered last year (and loved!) are no longer being sold…while there are always tried and true varieties offered, you can also count on something new appearing every year. Maybe that’s what keeps us hooked. That and the hope that this will finally be the year without the bugs, the weeds and with the gorgeous, bountiful harvest. Do you have any tips you’d like to share? A favorite seed catalog we missed? Something you’d like more clarification on? Leave a comment below and we’ll get back to you.